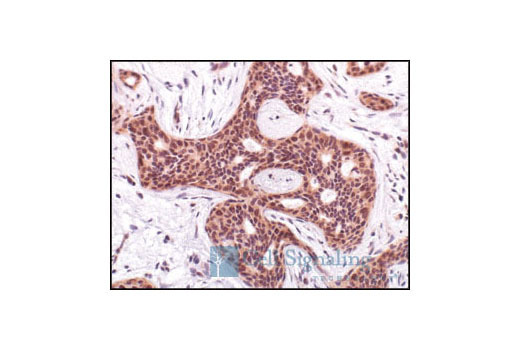 Immunohistochemical analysis of paraffin-embedded human breast carcinoma, showing cytoplasmic and nuclear localization, using Phospho-Akt (Ser473) (736E11) Rabbit mAb. 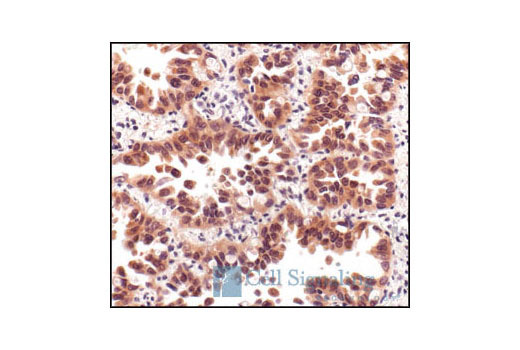 Immunohistochemical analysis of paraffin-embedded human lung carcinoma, using Phospho-Akt (Ser473) (736E11) Rabbit mAb. 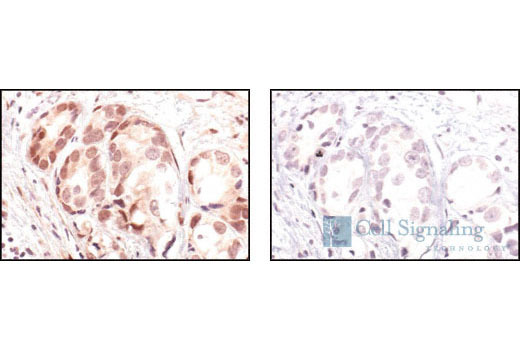 Immunohistochemical analysis using Phospho-Akt (Ser473) (736E11) Rabbit mAb on SignalSlide (R) Phospho-Akt (Ser473) IHC Controls #8101 (paraffin-embedded LNCaP cells, untreated (left) or LY294002-treated (right). 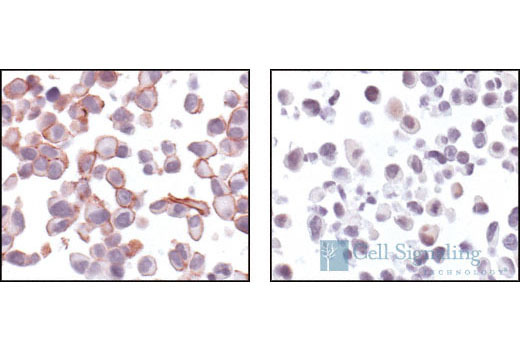 Immunohistochemical analysis of paraffin-embedded human prostate carcinoma, using Phospho-Akt (Ser473) (736E11) Rabbit mAb preincubated with an irrelevant peptide (left) or Phospho-Akt (Ser473) Blocking Peptide (#1140) (right). 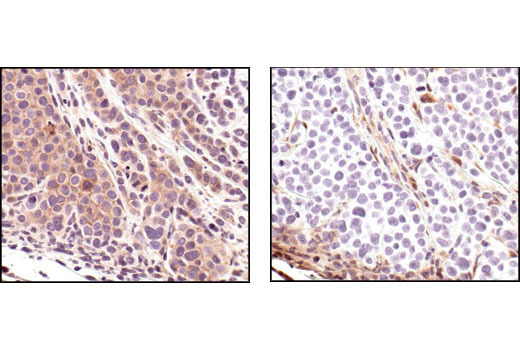 Immunohistochemical analysis of paraffin-embedded MDA-MB-468 xenograft, using Phospho-Akt (Ser473) (736E11) Rabbit mAb (left) or PTEN (138G6) Rabbit mAb #9559 (right). MDA-MB-468 cells lack PTEN. Note the presence of P-Akt in the PTEN deficient cells. 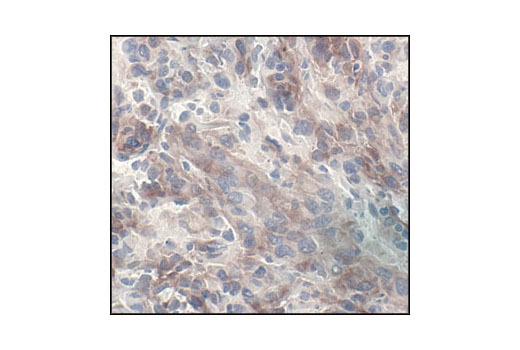 Immunohistochemical analysis of frozen U-87MG xenograft, showing predominantly cytoplasmic localization using Phospho-Akt (Ser473)(736E11) Rabbit mAb. To prepare 100 ml, add 18.75 ml 16% formaldehyde to 81.25 ml 1X PBS. Wash Buffer: 1X Tris Buffered Saline (TBS). To prepare 1L 1X TBS add 100 ml 10X Tris Buffered Saline (#12498) to 900 ml dH2O, mix. Blocking Solution: 1X TBS/0.3% Triton X-100/5% Normal Goat Serum or 1X Animal-Free Blocking Solution. 1X TBS/0.3% Triton X-100/5% Normal Goat Serum: add 500 µl Normal Goat Serum (#5425) and 30 µl Triton X-100 to 9.5 ml 1X TBS. Antibody Diluent 1X TBS/0.3% Triton™ X-100/5% Normal Goat Serum: add 500 µl Normal Goat Serum (#5425) and 30 µl Triton™ X-100 to 9.5 ml 1X TBS. For tissue stored at -80°C: remove from freezer and equilibrate at -20°C for approximately 15 minutes before attempting to section. This may prevent cracking of the block when sectioning. Section tissue at a range of 6-8 µm and place on positively charged slides. Allow sections to air dry on bench for a few minutes before fixing (this helps sections adhere to slides). Fix sections in 3% formaldehyde for 15 min at room temperature. Proceed with staining procedure immediately (Section D). Wash sections in wash buffer twice for 5 minutes. Incubate for 10 minutes at room temperature in 3% Hydrogen Peroxide. Block each section with 100-400 µl of preferred blocking solution for one hour at room temperature. Remove blocking solution and add 100-400 µl primary antibody diluted in recommended antibody diluent to each section. Add 100-400 µl biotinylated secondary antibody, diluted in wash buffer per manufacturer's recommendation, to each section. Incubate 30 minutes at room temperature. Remove secondary antibody solution and wash sections three times with wash buffer for 5 min each. Apply 100-400 µl substrate to each section and monitor closely. 1-10 min generally provides an acceptable staining intensity. If desired, counterstain sections in hematoxylin (#14166). Phospho-Akt (Ser473) (736E11) Rabbit mAb detects Akt1 only when phosphorylated at serine 473, and Akt2 and Akt3 only when phosphorylated at equivalent sites. Monoclonal antibody is produced by immunizing animals with a synthetic phosphopeptide corresponding to residues surrounding Ser473 of mouse Akt.